Charles Hugh Smith* points out the quality of many internationally sourced products has nosedived in the past few years .. add to that massive current overcapacity .. it's basically inflation - declining quality in products is like paying more for the same quality products .. "Why has the quality globally sourced products nosedived? The obvious response is corner-cutting to lower costs to maintain profit margins .. Central bank stimulus: QE (quantitative easing) and ZIRP (zero interest rate policy) are the drivers .. Nearly free money was intended to bring demand forward as a means of boosting a stagnant global economy. But there are unintended consequences of this policy: nearly free money doesn't just distort demand--it also distorts supply .. 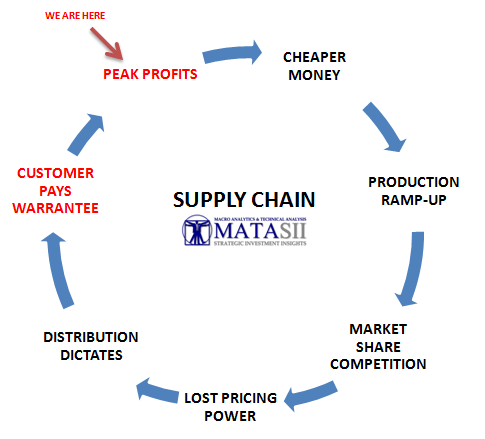 Overcapacity leads to the collapse of pricing power, and the collapse of pricing power leads to the collapse of profits. In a market of strong demand, producers have pricing power: they can raise the wholesale and retail prices of goods a notch at a time and reap more profit. But when demand is stagnant or supply far exceeds demand, pricing power vanishes: any attempt to raise prices causes retailers and consumers to flee to other suppliers. In an economy of overcapacity, the only way to maintain profit margins is to lower production costs (including labor) or cut corners: lower quantity and quality, or cheat the labor force or customer (or both) in one way or another."